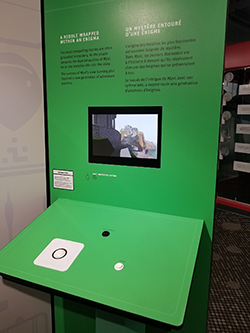 They opened a video game exhibit at the Telus World of Science in Vancouver. My family and I were poking through the exhibits when I stumbled upon this tucked away in one of the corners. 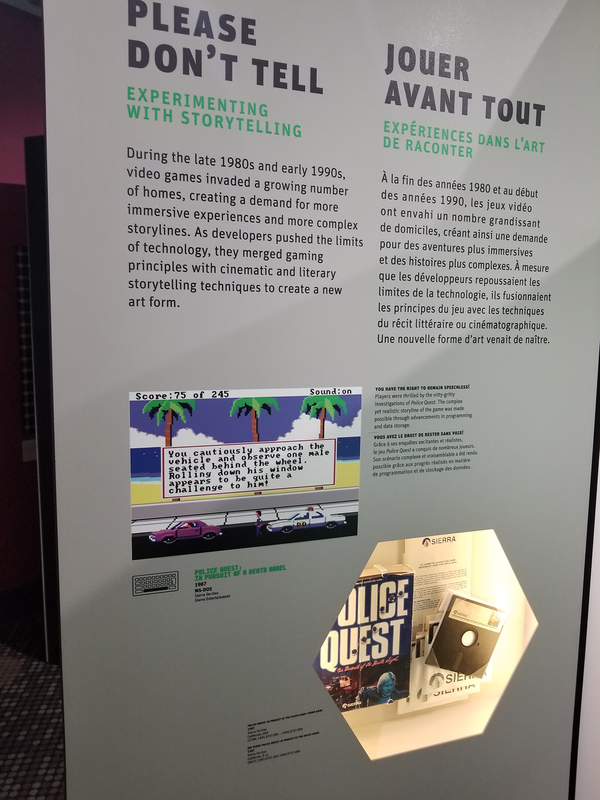 I thought it was an amusing find, given how mainstream the rest of the exhibition was (Mario, Pac-Man, Tetris, Guitar Hero, etc.) 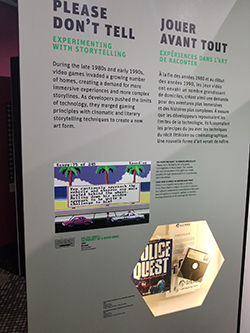 But it did have me second-guess PQ's status as a storytelling pioneer since the rest of Sierra's catalog until then was either sci-fi, fantasy, or LSL. Either way, many kids are learning about Police Quest today. A little more amusingly, right next to the display was a machine set up to run Myst. When we found it, the attendant told us the game was broken, but they just didn't know how to play it. 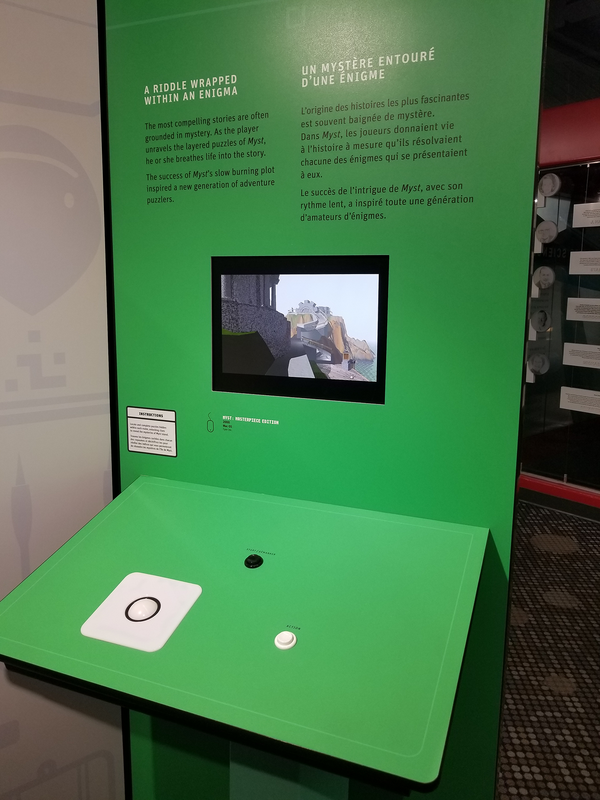 So I had the smug pleasure of showing a small crowd how to play Myst. I'm sure this is an old joke. I tried playing Myst, but until I figured it out, it always Mystified me. Yes, quite an amusing tale, Datadog. Nice one. That's pretty funny! I like that they have MYST up to play but no idea how to play it. You'd figure they would have employees who would be trained (experienced?) in the demo games. Datadog, I see an opportunity to train some of their employees for some extra side cash? To clarify a little, when the Myst demo starts, the game starts the player in the library, facing STRAIGHT UP at the ceiling at a strange pattern. So anyone who doesn't know where they are, or how to look down would think the game is stuck. And I did get stuck after a minute because I forgot how to beat Myst. I got as far as the clock puzzle and forgot how to raise the bridge. While explaining the game to my wife, she said it reminds her of an ancient Chinese proverb that goes something like "To learn, one must either walk a 1000 miles, or read a 1000 books." I told her she just described Myst's gameplay in a nutshell. Not just an illustration! That is an actual unboxed Police Quest case! I wonder if there were people who didn't know what it was. I heard jokes about how kids think 3.5 disks are "the save button", but to be fair, we all carry cards, flash drives, and assorted chips that we plug into things all the time, so it's not a stretch for a kid to understand what a 5.25" is. Especially when I can walk into a drug store and see a sale on vinyl records. Ha! Everything old is new again. Plus ça change, plus c'est la même chose! That is pretty amazing that they singled out PQ for the display. And they did some nice work putting the display together. Good find. That's really neat! Maia and I never visited the Telus World of Science when we lived on the mainland. Too bad an exhibit like that didn't come to the Royal BC Museum. We have memberships there! I know I shouldn't nitpick, as it's wonderful whenever Sierra gets attention like this, but I look at that blown-up screenshot and all I can think is "fix the aspect ratio!"